Find the right wedding jeweler that can help you choose shining wedding jewelries. You have that gorgeous engagement ring on your finger. Now you have to pick out wedding bands for you and your fiancé—not to mention any extra sparkle you want to wear on your special day. Kasey Bubb of Diamonds Direct, the official wedding jeweler of the Jacksonville Jaguars, gave us five helpful tips for wedding band shopping. 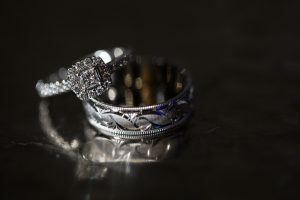 Choose a wedding jeweler who will educate you on your purchase, not just try to sell you something. There are many factors that affect the price of diamonds and fine jewelry. Learn about these factors and choose the right rings for your personal style, needs, and budget. Include your wedding bands in your overall wedding budget. Having a realistic set amount to spend is always smart, so your sales associate can help guide you to the best possible options for you. 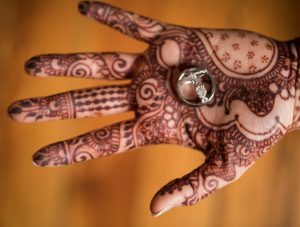 Some couples even choose to finance their wedding bands to help offset the cost of their wedding. Today’s wedding band options are limitless. You always have the option of the classic matching band, but now we’re seeing more mixed metals, colored gemstones, and intricate designs. Men’s bands have become more diverse as well, available in a variety of materials, including tungsten, carbide, meteorite, hardwood, and even compressed diamond. The best way to figure out your personal wedding band style is to try on multiple options. Figuring out what you don’t like will help you figure out what you love. A wedding band is something you’ll wear every day for the rest of your life. Some ring styles are more comfortable than others, and everyone’s fingers are different. When trying on rings in the store, they may not be exactly your size, so try to imagine what the ring will look and feel like in your finger size and how comfortable it will be throughout your daily activities. Think about whether you’ll want to wear just the band at times or if you’ll always wear it with your engagement ring. If you have to special order your wedding band, it can take four to six weeks to arrive. There’s nothing worse than stressing about whether your ring will come in time for your ceremony, so we recommend placing an order at least three months in advance, if not sooner. Your wedding band is perhaps the most important piece of jewelry you’ll ever own. Take time to make the right choice for you.